During his senior year at Harvey Mudd College, Craig Demel had a sign hanging on the door of his room in the Foothill Apartments that said "SENIOR" in black block letters on a yellow background. The following year, the sign turned up at the Seventh Dorm auction and was purchased by Cliff McCarthy, who was a senior in South that year. The sign spent the year hanging on his door, and at the end of the year he passed it on to Jennie Hango, soon to be a South Dorm senior. And thus, a tradition was born. The sign has remained in South ever since, being passed on each year to a worthy senior. 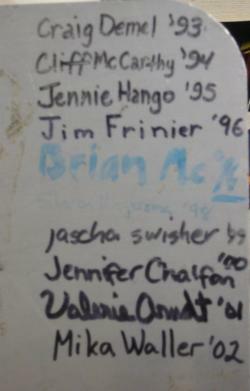 On the back of the sign, the names of its owners are listed, a tradition started by Jennie. This web page serves to track the history of the sign, as well as the various individuals who have been the sign's curators over the years. If you would like to add or update a photo, e-mail address or URL, send mail to cliff at magpu dot com. Also contact me if you're a privacy freak and object to having your name listed here.